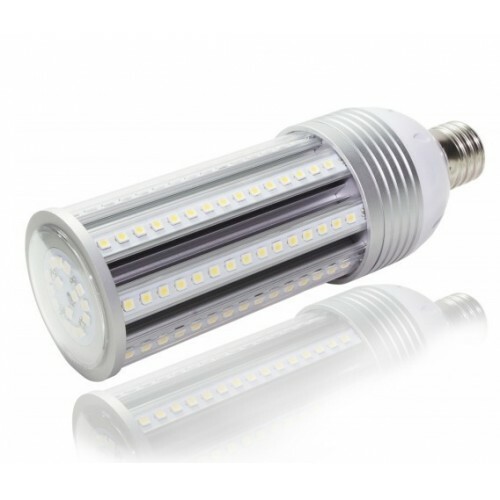 Our "LL E39-45W" is a 45 Watt LED "Cylinder" type lamp which is a cost effective upgrade for HID, HPS, MH, Mercury Vapor or CFL lamps, useful when the fixture or head does not need replacement. This product is available with an internal driver or the companion Meanwell driver assembly for most efficient choice of installation. Diameter x Length / Weight 3.7 x 10" / 1.9 lbs. This product is proven to offer massive savings and immediately improves light quality. Because most outdoor lights are on 10-12 hours per day, the ROI for this product is generally under two years. We tested four (different manufacturer) LED cylinder products in a facility parking lot in Scottsdale, Arizona over a two-year span. Our resale product is the top performer of the bunch, and operated flawlessly. To determine what wattage is necessary for your needs, consider that the approximate savings ratio should be around 75%. No flickering, buzzing, hertz cycling or RF interference. No UV radiation = less insect attraction. Instant on to full brightness, doesn't require "warm-up" period. LED light has directional capability - reduces light pollution. Please note: This product is available in additional power and color temps as well. *The product you receive may be appear slightly different than the product photo. Our manufacturers are constantly upgrading/improving their products.